I would like to thank coaches Joe Kenn and Mike Robertson for partnering together to bring us EADS14. Both of these coaches provided keen insight into the how and why behind their programming with the passion that you would expect from two of the best in the business. Though the coaches are very successful in their respective areas of coaching, they constantly preach to learn new techniques, modify them to fit your beliefs, and apply them to fit into your program. More importantly, they showed how they have adapted their own programs through the years and are always looking to continue to modify what they do. I highly suggest EADS to any coach looking to enhance their program with superior programming and coaching techniques. I have already modified and applied several techniques into my program, and I look forward to learning more from them at EADS15. Nearly two weeks ago, I had the opportunity to attend what I would call the most knowledgeable and informative seminar ever. Over the course of just 2 days, one could have obtained enough information to last a lifetime. Elite Athlete Development Seminar coaches Joe Kenn and Mike Robertson poured their hearts into teaching everyone that was in attendance of not just how to become some of the most knowledgeable coaches, but the best in anything you do period! Starting with Mike Robertson, he is one of the sharpest coaches I have met when it comes to knowledge on anatomy of the body. Mike presented information on breathing mechanics to demonstrating functional ways to improve posture. I heard Mike speak once before at a clinic in Louisville about 5 years ago, and the most noticeable thing from 5 years ago to this seminar was how he has continued to educate himself to stay above the rest in what he does best. And this is where Mike is able to succeed because he knows what has brought him this far, and never goes against the integrity of what he believes. By making tweaks here and there allows him to continue to give the best coaching for the best results. As a strength coach, listening to Mike speak really brought me back to the root of what has made me start in this field in the first place, and that’s the passion for science and anatomy. We must find our passion in what we are doing. For some of us we may not find this out for some years, but for others once you figure it out, continue to perfect your craft to stay ahead of the others. During #EADS14 one major question that was asked of all attendees by Coach Kenn (House) during his presentation which I had to ask myself again was.…. “Why do you go into work every day?” This question can go a long way. As for me, there wasn’t hesitation at all to realize my answer. We should all ask ourselves this question. House’s presentation had to be one of the most unique ways I have ever heard anyone get their message across. For beginners, House has played a major role in my life personally, from being the collegiate strength coach at my alma mater last two years of my football career then following that by giving me my first opportunity to put my amateur coaching skills on display. And most of all he has taught me how to be a professional. One thing I have learned most of all is to give credit where credit is due. On to the seminar, as stated earlier, I have never heard such a profound way to get a message across, and House did just that. Prior to being introduced to the tier system, I had to be one of the most stubborn coaches around. Doing what I have only learned through reading not what I have put into practice. As for the tier system, House was quoted as saying “in order to have a successful program, you cannot break the integrity of what the program was built for.” Now that does not necessarily mean you cannot change or make tweaks. It just means that what has been laid at the foundation should not be broken to make it better (House). As House continued his presentation there was not a person in the room that was expecting what was to come next. Off the script and off the board he went into coaching 101. The most inspiring part of this session was how someone as himself (House) who has been in the profession this long continues to have such a burning passion for coaching. Coming from young coach in the field, I had to question myself; do I have this type of passion and desire to want to be the best and continue to impact lives? If not, then it was time to start looking into other professions. Because I know at the end of the day if I didn’t have that type of desire to want to be the best and give the best what would my reasoning be to continue? Coaching was described in many ways during #EADS14, and Coach Kenn was able to break it down into six basic methods that we all were able to take with us. We are able to control our ATTITUDE, EFFORT, and PREPARATION. We are able to manage our ROLE and EXPECATIONS. We are able to develop BASE FUNAMENTALS. There were a few quotes that better explain what we are able to control that I took from the seminar. What we are able to manage is also our choice. What we develop requires us to be disciplined in the first four methods. Base fundamentals will not come easy. It will take time, effort, discipline, and last but not least you must establish who you are as a coach. This is where I will put an end to this review. Be a great listener and do for yourself what others cannot do for you. Never sacrifice what you believe in to please someone else. Overall this was a very encouraging seminar that I look forward to attending for years to come! On March 28-29, 2014, I had the great pleasure of attending the first ever #EADS14 Seminar. I knew this was a seminar I absolutely could not miss because the instructors were Coach Joe Kenn and Mike Robertson! Both speakers not only talk the talk, but they walk the walk. Each has invested years of work in our profession as coaches charged with the challenge and responsibility of developing and training some of the world’s most elite athletes! Who wouldn’t want to learn from them? With these top notch coaches running the show, you better believe the seminar delivered top notch information, and then some! This was unlike any other event I’ve ever been to and I’d like to hit some of the highlights for those that could not attend. 1. Release – decrease stiffness by foam rolling. 2. Reset – autonomic nervous system balance. Breathing exercises, crawling patterns. 3. Readiness – warm up, get ready for a big time training session. 4. Reactive – improve speed, power and explosiveness. Jumps, throws, anything fast and explosive. 5. Resistance – goal is to get stronger. Get in the weight room and train! 6. Resiliency (Changed from Regenerate) – develop sport specific work capacity. Sleds, ropes, kettlebells, just about anything. 7. Recovery – shift from training mode to parasympathetic chill out mode. Relaxation and breathing drills, cold plunge, stretching. 1. Have a vision for the athlete. – What kind of player does their coach want to be? – What does the competitive season look like? – Understand that the athlete must take 2-4 weeks off after a long season. – How much time do you really have? – How many training phases? – How many training days per week? 3. Develop the specific game plan. – Once the actual amount of days the offseason will be, it’s time to get after it! Mike reviewed case studies he actually uses for MLS athletes and combine prep. As he summarized his information, the attendees began to visualize how all the components of his presentation come together to develop a clear picture of exactly how to create one truly awesome training program! Mike displayed exact templates, exercises progressions, sets and reps, everything! This was a huge benefit for me because a lot of coaches at seminars do not like to show their exact work. The amount of depth he went into was farther than most presenters’ deliver, which was the beauty of this seminar! Mike encouraged questions and conversations with the attendees about all topics throughout all of his presentations. He also gave a thorough explanation of why he does what he does, which included actual examples of how to apply each principle discussed. To find out more about Mike Robertson and the R7 Approach to Training, visit his website at www.robertsontrainingsystems.com. This man needs no introduction! His quality of work has been proven year after year at both the collegiate and professional levels. I was fortunate to have interned for him after my playing days for the University of Louisville Football Team. Since this was back in 2009, I knew that the Tier System had evolved and was anxious to see the new changes. With no worries on how long he could talk like at other clinics, we were now officially on Eastern Standard “House” Time! 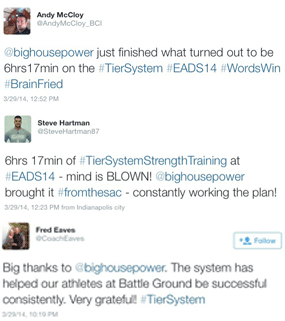 A whopping 6 hours and 17 minutes worth of Tier System Strength Training! He covered everything from the day he created it, to what he does today in the NFL, and everything in between since its existence. Coach has always stuck to the integrity of his system but keeps cranking away at how to make it better. As Coach would say – Absorb, Modify and Apply to constantly work your plan! With all of this information being shared by Coach Kenn the major take away was, “The Tier System is based on the daily rotations of exercises from three basic movement categories. That’s it!” To make the most out of the movement categories (Total, Lower, Upper) you must be great at making the exercise pool. To do this, write down every exercise you can coach for each category, and then rank them in order of importance. He then reverted back to Mike’s R7 approach and how he added Root (core training) to make it R8. From this point forward coach explained the rules to designing an updated Tier System template, and the addition of a new Tier for training neck. I have seen Coach speak many times before, and at no other time have I seen him go into this much detail. With 40 pages of notes and slides included, the Tier System 5.0 presentation was one for the ages! In closing his portion of the seminar, Coach Kenn introduced yet another whole new level of reality with his talk about “Coaching 101 – So You Want to Be a Strength Coach!” This topic really hit home for me as it was all about the truths of our industry. Here are some excerpts from this talk. “Why am I here? My parents showed me what a work ethic was and my coaches showed me how to be a competitor.” Coach shared many personal stories about his family, college teammates, teachers and colleagues. Though there are many people he thanked and was influenced by, his true reasoning as to why he does what he does is the athletes! That’s what it’s really about, making an impact on the careers and lives. Again, going back to just arriving at that big time job that everyone wants. Be thankful that you have a job because there are a thousand other people out there that would do anything to have yours! If you want to be a great strength coach, your preparation will determine your outcome. If you want to be great, prepare to be great! No one is going to hand you that next level position. See your job as a big time opportunity and make the most of everything while you’re there. In other words, who are you going to be? Are you going to develop the personal attributes and character it takes to get to the next level? Are you going to accept the challenge and make the commitment necessary to perform at the highest level possible? Are you willing to focus on issues and actions you can control and dismiss those that you cannot? If this industry is truly your passion, you will find a way to make it work. As I review my two days attending #EADS14, I realize every aspect of the entire event went far beyond any expectations I had. I want to thank Mike Robertson and Coach Kenn for their incredible effort and energy in making the seminar one of the best I have ever been to. All of the attendants were great people that I also had the chance to network and converse with. If you have the opportunity to be at the seminar in 2015, I strongly urge you to make it happen! You, your colleagues and most importantly your athletes will all benefit after learning from these two great coaches! "Training with Coach Kenn for my senior year of college was very beneficial to me. He has a great understanding of what exactly athletes need to prepare for the long season that awaits them. I trust his opinion on any aspect of strength and conditioning and hope to work with him for a long time in the future"